In a subtle message to China, Indian Prime Minister Narendra Modi said on Tuesday that India would supply naval vessels to Vietnam. This would be India’s first significant military transfer to Hanoi. The development is notable as it comes at a time when Vietnam is tied in a territorial dispute with China on the south China sea. Modi’s announcement came after his meeting with visiting Vietamese prime minister Nguyen Tan Dung. Besides agreeing to help Vietnam modernise its military, India also offered to buttress its activities in Vietnam’s energy sector. India will sell four offshore patrol vessels to Vietnam, which will be used to improve the latter’s military presence in the energy-rich South China Sea. Last month, India had announced a $100-million credit line to the south-east Asian nation for defence purchases. 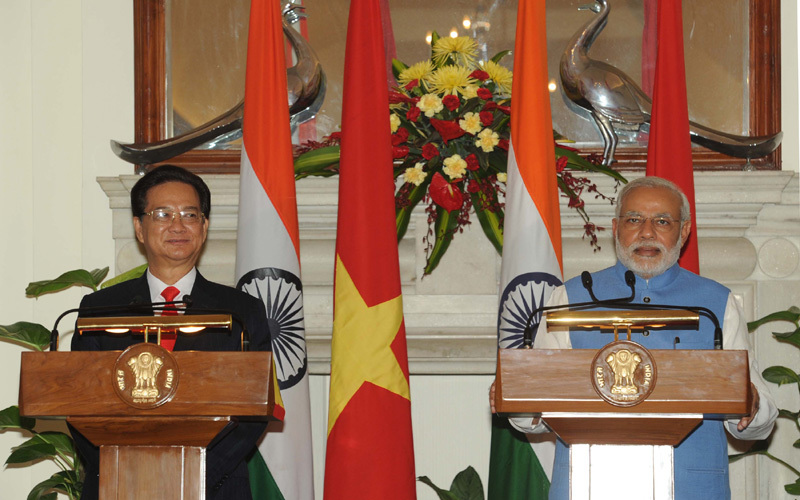 On Tuesday, India announced another $300 milion credit line to Vietnam to expand trade ties. During the Vietnamese PM’s visit, India has been offered two oil fields for exploration in the South China Sea. China and Vietnam are at loggerheads over the ownership of a clutch of uninhabited islands in the South China Sea known as Nansha or Spratly. Beijing has traditionally objected to New Delhi’s exploration efforts in the resource-rich waters where China, Vietnam, the Philippines, Malaysia, Taiwan and Brunei have competing claims. While both India and Vietnam have territorial disputes with China, the two countries have also adopted a unique strategy of beefing up their defence mechanisms while at the same time cooperating with China on the trade front. During the Vietnamese PM’s visit India and Vietnam also signed an agreement, under which India’s state-run oil exploration arm, ONGC Videsh, will enhance cooperation with PetroVietnam. “The agreement underlines Vietnamese invitation to OVL to expand its presence in Vietnam and further consolidate cooperation in exploration and other areas between the two countries in energy sector,” the two countries said in a joint statement. Dung was accompanied by a large business delegation from Vietnam, which had separate meetings with India’s industry bodies such as CII, FICCI, and ASSOCHAM. The two PMs urged the business leaders to explore business opportunities on both sides.